To support the quest for attainment of Nigeria’s agriculture mechanization goal, IITA has signed a training agreement with Origin Tech Group Nigeria Ltd, a private sector investor who is interested in bridging tractor and agriculture equipment deficit in Nigeria. Origin Tech Group Nigeria is a local agricultural value chain company providing value-technology in agricultural advisory, civil engineering/construction of farm estates, farmland clearing, and manufacture of farm machines among others. 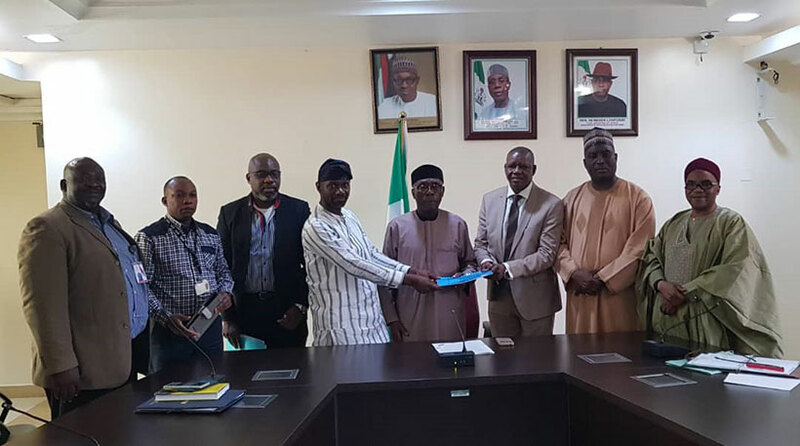 IITA team with Minister of Agriculture, Chief Audu Ogbeh (center) and officials of Origin Group Nigeria at the signing ceremony. The Agreement signing ceremony held on 10 February at the Federal Ministry of Agriculture and Rural Development. The event was chaired by the Honourable Minister of Agriculture (HMA), Chief Audu Ogbeh. The Managing Director, Bank of Agriculture (BoA), Dr Kabiru Adamu and Director, Federal Department of Agriculture (FDA), Dr Amin Mohammed Babandi were also present. The Training Agreement is part of the Origin Group initiative aimed at establishing a world class farm equipment leasing company in Nigeria. The training component, which will be executed by IITA, involves capacity building for youth in tractor operation and farm equipment servicing and repairs. Explaining the rationale behind the project, the Group Managing Director and CEO, Mr S.J. Samuel said, “the Project is developed as a response to the high rate of drudgery and low yield of farmers in Nigeria.” Samuel was accompanied by Training Coordinator Anthony Agbonlahor and General Manager Shepherd Kondo. Gbassey Tarawali, Head, IITA Abuja Station, expressed IITA’s readiness to deliver on its commitment in the agreement. In addition to Ibadan, he stated that IITA is well positioned to effectively deploy its facilities that are strategically located in Abuja, Kano and Rivers States in contributing towards the achievement of the Agriculture Promotion Policy of the Federal Government. Project Administrator Ijie Ben Asuelimen accompanied Tarawali. Responding to the various comments and presentations, Chief Ogbeh lauded the initiative and thanked Origin Group for partnering with IITA in implementing the novel Tractorize Nigeria Project. He enjoined the organization to work with FDA and BoA, who are already implementing agriculture mechanization activities. He appreciated the fact that the machines and equipment will be sourced from Brazil and India and that the operators will be adequately trained by IITA. This, according to the minister will guarantee a longer life span of the machines and equipment from the present average life span of 2 to 3 years to a minimum of 20 years. Under the Agreement, IITA will design, develop, and conduct best-in-class international standard expert training for participants in the Tractorize Nigeria Project. This is in addition to conducting practical exercises and capacity building activities for Nigeria youths among others.